It is a semi dry stew made of lots of vegetables. It is very tasty dish and can be served with plane rice and rice puttu. =►Peel and cut the above vegetables to half a finger length and 1/2inch thickness. =►Drain if there is any water and pour it to a cooking pan. =►Add turmeric and mix it properly. 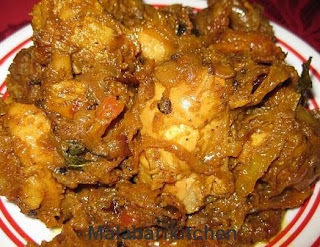 =►Add mashed curd into it. Stir and allow it to cook for another 5-8 min on sim flame. =►Stir it occasionally so that the curd do not form lumps. 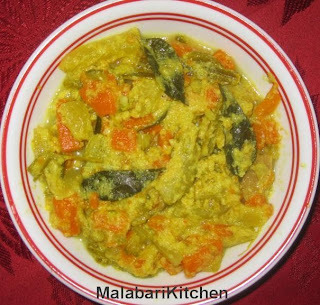 =►Grind together the coconut, cumin seeds, curry leaves, and green chilies. (1min in blender) .Don’t need to make a fine paste. 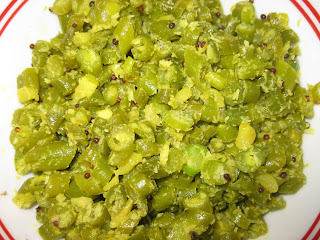 =►Add curry leaves and oil for garnishing. Note: we don’t add vegetables like beetroot, as it completely changes the color.